Google News optimization fascinates me because it is a different algorithm and there are weird rules. I knew Google News had a rule about having 3-digit unique number in the URL if you do not use Google News Sitemaps but did you know that if you used 1999 or 2000 in the URL that you are out of luck? The exception is if you've got four digits and it leads off with 199 or 200, as you can see, those typically reflect a year. However, now that we've got into the 2010 and beyond years, 201 actually works for your article URLs. All this is said always with an exception. If you decide that your CMS doesn't spit out these random three digits, that's fine as well. 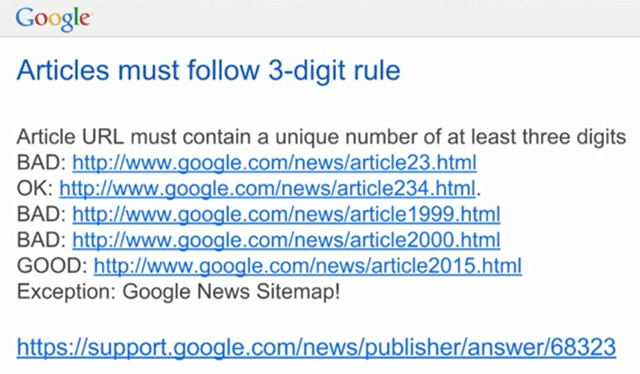 You can always submit a Google News Sitemap. You submit that through your webmaster account. And then you don't have to abide by Google News's three-digit rule. Previous story: Google: Make A Change To Your Web Page? We'll Find It.